Target: 100% renewable energy target in public transport and heating by 2020, reduce CO2 emissions by 50% below 1991 level by 2030, and become carbon neutral in 2050. Status: In progress - In 2014, 60% of the energy used by the city to power the public transport system was sourced from hydroelectric power. RES: Hydropower, biogas, Passive House buildings, and hydrogen and electric vehicles. Implementation: Oslo is Norway’s capital and is the most populous city. It aims to achieve 100% RE through its Energy Action Plan, built on previous initiatives by the city such as the municipal Energy and Climate Fund, which was implemented in 1982. Thanks to a compact urban fabric and a high share of public transport use (62% in 2010), Oslo per capita CO2 emissions is already one of the lowest in Scandinavia (around 2,3 tonnes in 2007). Heating and transportation account for the highest share of CO2 emissions. The city aims to increase the share of fossil-free hydrogen powered vehicles in the city’s operators fleet by 2020 to reach its 100% target. Although the city does not own any vehicles itself, Oslo municipality and Akershus County Council does own the transport management company, Ruter AS. This enables the two public bodies to influence the decisions of operators. In 2014, the City of Oslo in cooperation with the surrounding regional government of Akershus County approved a Regional Hydrogen Strategy to reinforce the target set, and are working together to develop an infrastructure with biogas, hydrogen and electric vehicles. Reducing emissions in the heating of city buildings is another priority. By 2013 all municipal buildings were using 100% renewable energy, and from 2014 all new municipal buildings had to be of Passive House construction. Today, the city’s heating system is powered by 80% renewable energy, mainly from sourced from residual waste biomass. 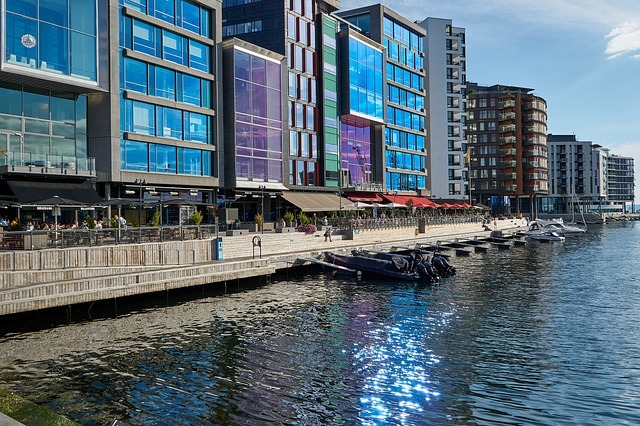 In 2010, FutureBuilt, a ten-year program, was launched by Oslo and 3 municipalities part Oslo’s Region to stimulate climate friendly urban development. 37 pilot projects, including private and public buildings as well as urban areas, were developed in 2015.